Ever since The 5th Wave came out a couple months ago, I’ve heard nothing but people raving about how un-put-down-able it is. I didn’t know much about it other than it was about aliens (which, enough said, right? I mean ALIENS!) and was apparently The Awesome. It’s been way too long since I’ve read an alien book that I absolutely loved (like, decades-long. Hm. This is a problem. ), so I was super excited when my library got a copy right before I was about to leave for a couple weeks of various travels. Traveling times are always great reading times, so I tucked this one into my luggage (along with several other books, obviously. My luggage was heavy.) and started reading a few days later. I’m going to try to give away as little as possible of the plot in this review, because I honestly feel that going into this book knowing essentially nothing about it is the way to go. It made each reveal thrilling and satisfying, and made it impossible to stop turning pages. It’s been a while since a book has led me to stay up way past my bedtime, because I simply could not put it down. But this book was one of those books that reminded me how much I love reading, and how much I love the sci-fi genre in particular. This was the alien apocalypse book I never knew I always wanted. So let’s get into it. The 5th Wave follows two primary points of view, Cassie and another guy whom I will let you discover as you read (he is not, as the blurb suggests, Evan Walker — although Evan does get one short POV section, as does one other character). Both eighteen-year-old protagonists have survived the atrocities of the first four waves of invasion, and both have suffered heavy losses. Their stories run parallel for most of the book, with neither of them ever being aware of the other’s existence (either pre- or post-invasion), but there are common threads in each of their narratives that keep the stakes climbing for both of them. It’s brilliantly executed, and kept the tension ratcheting up throughout the story. Each of the characters in The 5th Wave was a fully-realized person. You can see how Cassie progressed from normal high school senior to semi-automatic-toting survivalist, and the same is true for all the main characters, from children to teens to adults to aliens. I felt like I knew these people, and it made me that much more invested in their struggle for survival against staggering odds. I loved — loved — the logic of the waves of invasion. Both the order of events and the execution were — with one minor exception — flawless. (I took issue with the birds. I have questions about the birds. But the rest of it is so well done that I don’t really care.) The aliens took a sculptor’s approach to the eradication of humanity, removing massive chunks at the start, then pulling out their fine tools to whittle down the survivors. It was terrible, but fantastic at the same time. And as far as the story itself, it was a constant adrenaline surge from beginning to end. Rick Yancey didn’t pull any punches. Each loss hurt, and victories came at a price. There were no characters who felt safe, no challenges I was sure could be surmounted. It’s one of the reasons this book is so hard to put down — you just don’t know if they’re going to make it. In a story where 97% of the human race is dead at the beginning, survival and success are very much not guaranteed. 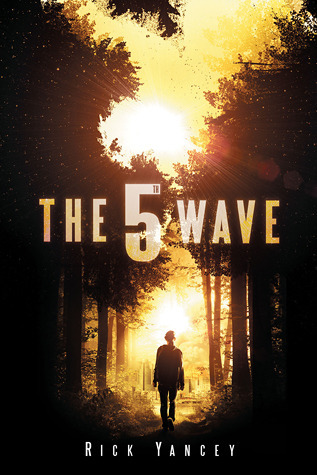 Overall, The 5th Wave was a thoroughly entertaining roller coaster of a book that kept me up all hours of the night. The premise is fantastic, the characters felt real, and the twists and turns of the plot kept me constantly on my toes. I loved it. This entry was posted in Post-Apocalyptic, Review, Science Fiction, Young Adult and tagged rick yancey, the 5th wave, the fifth wave. Bookmark the permalink. Ooh great review!! Reading lots of great reviews on this one! It’s in my TBR pile and I just have to find the time to work it into my reading week since it’s a long one! Planning to do so soonish, because it just sounds so incredible that I don’t want to wait much longer! It’s long, but it goes FAST. I read it in two days while visiting family and dealing with my kids. I’m dying to read this book! I’ve been avoiding reviews to avoid spoilers, but you said up front you wouldn’t give anything away so I read it. 😀 Yay! I CAN’T WAIT!